From far enough away, Yggdrasil is just a big tree – mildly impressive, yes, but nothing more. It’s only when you get up close that it’s tremendous width really becomes apparent – and it’s only when you look straight up along the trunk that you can see that the trunk continues up for what may be miles – and that the trunk and upper limbs do not just trail off in the usual mass of twigs and leaves. They may appear to do so to distant observers – but that’s simply because they are passing though the gate, and into the green galaxies – the current manifestation of the Elemental Pole of Wood. There the branches merge with the galactic forest – an network of gargantuan trees, which form an interlocking series of living Dyson Spheres, encircling unknown billions of near-eternal suns. Here you could, in theory, walk – or at least jump from branch to branch – across a mighty elliptical super-galaxy. The tiny filament of power which pours through the gate from the elemental pole suffices to render the surrounding area (a mere twenty or thirty mile radius) impossibly rich and fertile – although this is not always a good thing, as anyone attempting to weed or manage the surrounding forest can attest. If you should need more than that – a shaft of near-indestructible wood twenty miles long, a fifty-ton nut, a collection of magical plants (starting, of course, with the ability to neutralize gravity and hold an atmosphere in space), immense masses of silk, or vegetables, or exquisite fruits, or an orchid that produces delightful perfume in thousand-gallon lots… such things are a mere step away through the gate. If you stroll up one of the mighty roots, past the rune-inscribed obelisks that nestle in their grasp, and into a depression in the trunk, a pair of mighty doors will admit you to the spiraling ramp and “primitive” (or at least forest-themed) rope-and-wooden-cage elevators which provide access to the numerous chambers within. Nestled deep amongst the roots you’ll find cavernous storage and workshop chambers, along the way you’ll find spacious studios, apartments, zoolike pockets of forest and other natural environments, recreation rooms, and other spaces – until you reach the high chamber, with it’s surrounding platforms hidden amongst the foliage, and it’s exits onto the upwards sloping branches which extend through the gateway itself and into the near-infinite canopy of the Green Galaxy. Build Points: 10 (base) +2 (sacrificed hearthstone levels) +3 (a set of integrated enhancement artifacts) +3 (maintenance, normally performed by the servant force) = 18. Hearthstone: Trilobed Stone ***. Functions as a Farmers Stone (*), a Spell Stone (reduces the target number for Thaumaturgy by two, *), and as a Gem of Injury Sense (*). Comfort Zone (1): A minor side effect of it’s link with the Green Galaxy, this ability keeps the manse comfortable, with pure air, springy mossy “carpets”, restful forest color schemes, and so on. Living Manse (1): Yggdrasil is a colossal tree. This means that it’s affected by it’s own life-sustaining power and gains the benefits of constant exposure to the energies flowing through the Gate it sustains. It’s as durable as the colossal space-trees it emulates(however durable that is) PLUS it’s basic durability as a manse, and – barring some horrific disaster – will flourish near-eternally. Unfortunately, Charles as yet has very little idea what all that entails. Password Activations (1): The owner – or the Ratatosk – can close and seal the doors, override the elevators, lock down the gate, and authorize or deny the manse’s various abilities on an individual basis. Oasis. Yggdrasil provides irrigation and magical fertilizer for the surrounding area and any houseplants you want to grow inside. Modern Utilities. The manse has arcane equivalents of modern utilities and conveniences, such as running water, electrical power, cooking facilities, lighting, internet, elevators, and so on. Wyld Shopping. The manse uses a sub-aspect of the Gate power to allow authorized residents to simply pay for things (provided that they are available and for sale somewhere that the residents know of) and have them arrive within minutes (at most). Thaumic Shaping. 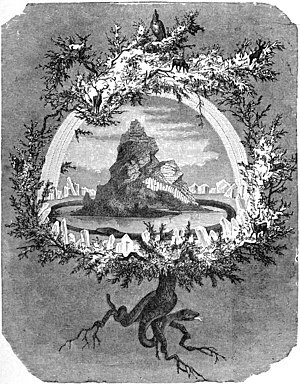 Yggdrasil allows each resident to draw three motes from the manse to power Thaumaturgy or Sorcery up to seven times per day. This does not count as an action; the motes are simply available when needed. Meditative Awareness. When meditating within the manse the hearthstone bearer can sense the flows of essence nearby, regains an extra four motes per hour, and can make normal perception checks on things happening within a radius equal to the manse rating in miles. Portal Control System (a “Stargate”, ***). When this is in use the gate to the Green Galaxy seals around the branches that pass through it, preventing anything else from passing through. Pocket Dimension Generator (***). This device essentially duplicates the effect that protects Freeholds in creation; making the area around the manse much “smaller”, limiting the access points, and concealing the entire thing. As a side effect, Raksha have no trouble respiring in the area and can add freehold features to it – or even expand the area the manse affects as if they were expanding a freehold. Thaumaturgic Forge (**). This device reduces the time required for thaumaturgy worked within Yggdrasil by two levels – usually to a single turn. Sampo (**). Under the direction of the Ratatosk, Yggdrasil can automatically turn fibers into cloth and cord, fruit into juice and fine wine, grains into flour, bread, pastries, and ale, wood into lumber, and other basics. While this won’t provide anything particularly advanced, it means that basic supplies and foodstuffs will never run short around Yggdrasil. Life-Sustaining (2, wood favored): Residents do not age, gain five bonus successes against disease or poison, and heal damage with incredible speed – regaining two levels of bashing damage every hour, one level of lethal damage every hour, and one level of aggravated damage every five hours. Bound Servant Force (3): Yggdrasil hosts some 650 Ratatosk – talking winged squirrels with a variety of thaumaturgic skills and a selection of charms that make them equivalent to first-circle demons / Essence-3 gods. The Ratatosk serve as familiars, guardians, and a maintenance crew – and, like all squirrels, busily harvest the bounty of the nearby plants. Given their powers, that the gate puts the nigh-limitless resources of the Green Galaxy itself immediately to hand, and the presence of the Sanpo, they can easily support thousands – and can just as readily provide the equivalent of Resources-**** if arrangements are made to sell some portion of what they bring in and produce. Otherworld Gate (5): Normally the elemental pole of wood (the Green Galaxy). This means that – under normal circumstances – you walk up the stairs or a ramp, out along a main branch – and out into the inner layers of a Dyson Sphere of mighty trees tying together drifting asteroids. The view is pretty spectacular.